It's always a great relief when you get a bite. To be more precise, after you've had a slow spell like I did last week it is wonderful to catch something. I went out on my own the other morning to do a spot of spinning. I've sort of lost track of the timing of first light since I was on holiday so I actually set the alarm a bit too early. 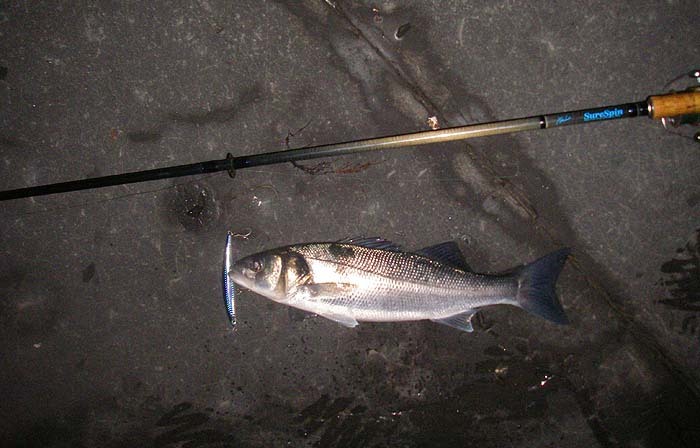 Anyway, I was down on the shore in loads of time and so I started fishing in the dark. Although I couldn't see much it was obvious from the surf and the wind direction that the water was likely to be a bit coloured. In addition the mountains of weed piled on the beach suggested that there would be lots of crap in the water to catch on my lure. On about the third cast I had a decent bite and hooked a fish that took some line against the clutch. I thought it was Christmas! 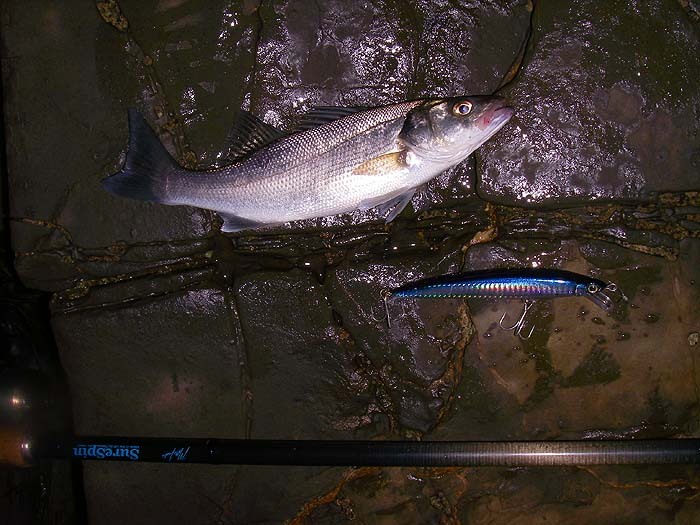 After a bit of a tussle I landed the bass and laid it on a rock so that I could take a picture. It's always tricky focussing the camera in the dark and I never remember to take a torch or a headlamp with me so by the time the fish lay still enough for me to get a shot and then to be unhooked using the pliers and returned it must have been a good five minutes. Now I always miss out on fishing because I mess about with the camera (usually while everyone else is catching fish) so I decided to put the pliers in my jacket pocket, and not bother with the camera. Good decision! In the next half-hour I landed nine more bass. The last one was tiny and by now it was quite light so I decided I'd better go and get the camera. Again it was five minutes fiddling (the little fish never sit still for long) and by the time I got back to the sea the bass seemed to have gone. Apart from one more pluck (another tiny fish) that was it, so I went home well pleased with my catch of ten. After my successful trip I decided to go the following morning to another spot about two miles along the coast (to see if there were any there). Again it was a shallow beach with lots of wrack and boulders and again I was early (not quite as early as the day before). Second cast, wallop! 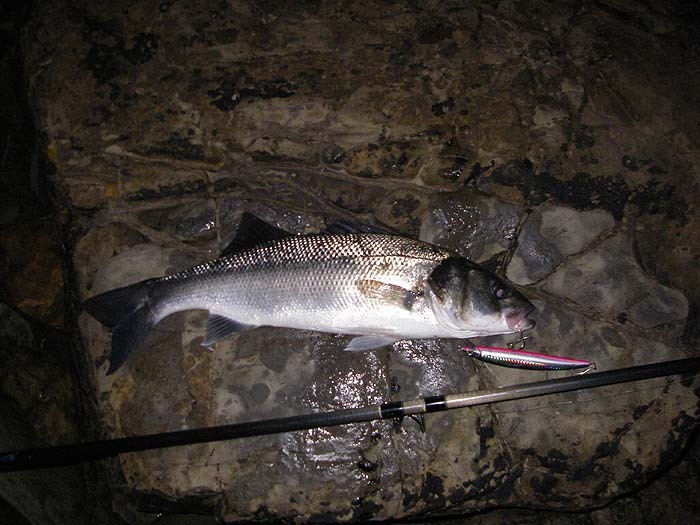 A decent bass took the plug and was landed, photographed and returned. This time I only managed another four fish but, all in all I felt that I'd got the run of bad luck out of my system.